Papergreat: 1959 receipt from The Colonial Bookstore in York, Pa.
1959 receipt from The Colonial Bookstore in York, Pa. The book has had great staying power over the decades. It was first published in 1940. A revised and updated fifth edition was issued in 1991 and sales of that edition remain strong on Amazon.com. It has been referred to as "the painter's bible." The cover price of this book in 1959 was $6.75, which was a significant amount of money in those days. According to The Inflation Calculator, $6.75 in 1959 is the equivalent of $49.91 in 2010 -- definitely a college textbook type of price (which is exactly what this 700-plus-page tome was considered in some places). But what about where it was purchased? 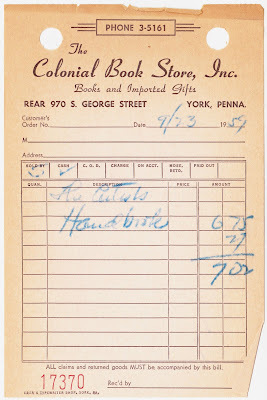 The receipt, dated September 23, 1959,1 is from The Colonial Book Store, Inc., ("Books and Imported Gifts") located at the rear of of 970 South George Street here in York, Pennsylvania. There's also a tiny gold bookseller's label2 for "The Colonial Bookstore" affixed to the bottom of the inside front cover. "My love for everything Wodehouse began when I was 14 years old. My mother and I were cleaning boxes out of my grandmother’s attic when she came upon a copy of Cocktail Time and turned to me and said 'You know, Kenny, you might enjoy this. Give it a try.' ... It was the same summer, and in significant part because of Wodehouse, that I decided to become a writer. (Admittedly, Austen, Coward and Shakespeare had something to do with it, too.) We lived in a smallish town in Southern Pennsylvania ('York' by name, the setting of one of my latest plays), and for the next several years I would make a yearly pilgrimage to the Colonial Bookstore (the one in the little shopping strip near the hospital4) to buy the latest Wodehouse – and then devour it in one unstoppable gulp that night. Thus were acquired and digested Aunts Aren’t Gentlemen, The Girl in Blue and many another late work of the master." Getting back to the 52-year-old receipt, it contains one final treat for historians and ephemeraologists. Check out the small type in the bottom left-hand corner of the receipt (shown magnified above). 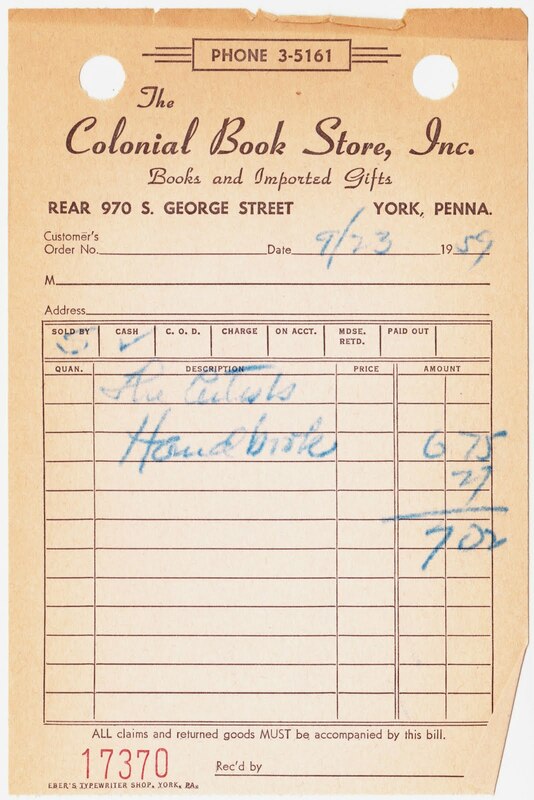 Apparently, this receipt pad for The Colonial Bookstore came from Eber's Typewriter Shop, also in York. I couldn't find anything regarding a business with that name (after a quick search online), but there are a few records for an Eber's Business Machines that was located on East Market Street in York. Beyond that, the floor is now open and I'm looking forward to any and all memories of The Colonial Bookstore and Eber's Typewriter Shop. 1. That's also the date that "Seinfeld" star Jason Alexander was born. 3. Coincidentally, "Crazy For You" is one of a handful of shows I've been fortunate enough to see on Broadway over the years. 4. That would be York Hospital.